China currently consumes a third of the world’s cigarettes—with more men smoking than women. Part of the problem is a general lack of awareness about the dangers of smoking, but another challenge is the sheer entrenched nature of the practice. It is so accepted that 23% of physicians in China smoke. A University of California research team suggests that Chinese nurses could be the key to helping smokers quit in China. The team notes how Chinese nurses have a very low smoking rate (much like the country’s female population in general). This was confirmed by a pair of studies that assessed the potential for nurses to help people quit smoking and how to give them the tools to do so. The first study saw an international group of investigations survey and question Chinese nurses about their interest in helping patients quit and their ability to actually do so. Over 2,000 nurses from eight hospitals were surveyed, with almost 90% of nurses saying they felt they could play a key role in controlling the country’s smoking. In the study, 64% of nurses asked patients about their smoking habits and 85% advised patients who smoked to quit—but only 17% arranged follow-ups. The study also highlighted the challenges the nurses faced, such as a lack of knowledge on effective tobacco interventions. Using these results, a web-based education program was devised. The program went over health impacts of first- and second-hand smoke, data on prevalence of smoking, information on nicotine addiction and withdrawal, and the “Five A’s” (ask, advise, assess, assist, arrange) intervention method. The same nurses who participated in the first study were sent links to the web program. After three months, 84% reported viewing it. 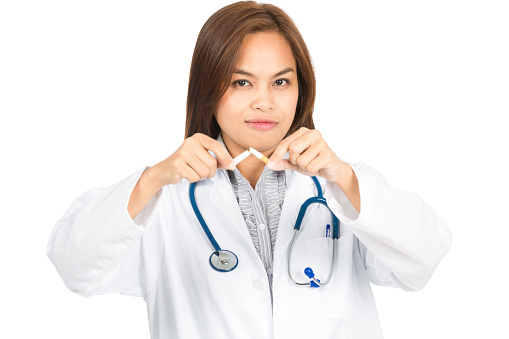 A second survey found that six months after the program’s initiation, nurses reported a marked increase in their likelihood to help patients quit smoking, primarily through the assess, assist, and arrange steps. Additionally, there was overall improvement in attitudes toward the roles nurses could play in tobacco intervention. The nurses increasingly recognized their ability to be non-smoking role models for their patients. Approximately 42% of the world’s cigarettes are made in China, with cigarette revenues making up 10% of the country’s annual income. In addition to a lack of education about the dangers of smoking, a number of myths make anti-smoking efforts more difficult among the populace. These include ideas that tobacco is a key part of ancient Chinese culture, that quitting is easy, or that Asians have a unique biology that makes smoking less harmful. The government has been raising cigarette taxes and declaring more areas of the country as “smoke-free,” but this has not significantly deterred the practice. As an analysis by Cancer Research UK noted, smoking is projected to kill about a fifth of the male population in this decade alone. Smoking currently kills around a million Chinese men per year and at the current rate, this number will grow to three million—a third of all deaths—by 2050. Chen, Z., et al., “Contrasting Male and Female Trends in Tobacco-attributed Mortality in China: Evidence from Successive Nationwide Prospective Cohort Studies,” The Lancet 2015; 386(10002): 1447–1456, doi: http://dx.doi.org/10.1016/S0140-6736(15)00340-2. “Nurses Could Help Cut Smoking Rates in China, According to UCLA-led Study,” UCLA Newsroom web site, October 8, 2015; http://newsroom.ucla.edu/releases/nurses-could-help-cut-smoking-rates-in-china-according-to-ucla-led-study. Sarna, L., et al., “Helping Smokers Quit: Behaviours and Attitudes of Chinese Registered Nurses,” Journal of Advanced Nursing 2015, doi:10.1111/jan.12811. Sarna, L., “Evaluation of a Web-based Educational Programme on Changes in Frequency of Nurses’ Interventions to Help Smokers Quit and Reduce Second-hand Smoke Exposure in China,” Journal of Advanced Nursing 2015, doi:10.1111/jan.12816.